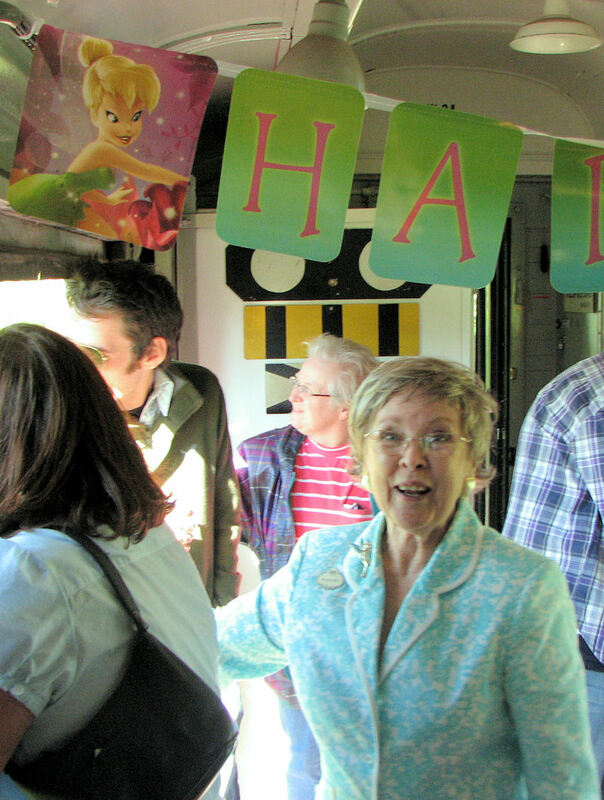 Yesterday, the 30th of May, Lynette and I rode the Pixie Dust Express – this was a train ride, fund raiser for the Duluth Playhouse and consited of an hour and one half ride on the North Shore Senic Railroad with delicious snacks and a birthday cake for Tinker Bell – the original that is – Margaret Kerry. Margaret was celebrating her 80th with family here in Minnesota. Margaret played Tinker Bell in the Disney animated feature of Peter Pan. Lynette and I had a chance to visit with her and for about five minutes and she even gave Lynette a hug – so my wife has had a hug from Tinker Bell – cool eh? Margaret told us how they filmed her doing everything with props and such so that the animators could get her facial expressions, movements and personality into the animated version of her. Margaret still has the twinkle in her eye when she talks about Tinker Bell. The time was enjoyable Saturday afternoon on the North Shore Senic Railway with very active and charming special guest. You can find out more about Margaret / Tinker Bell at TinkerBellTalks.com her official web site.